Blessing is a powerful technique to influence the psychological environment in a beneficient way and vitalising the food we intake and purifying the money we use from bad influences. By Roberto Assagioli , Source: Sundial House 1968. 2. Specific Radiation directed towards a definite target. Let us consider how to radiate. This is important for the success of our endeavour. 1. First comes a general preparation in which we concentrate on what we want to radiate. In the case of a spiritual quality, an effective preparation consists in arousing in ourselves that quality, of identifying ourselves with the idea, the feeling, the qualified energy. Then it radiates spontaneously. In this way we can combine both spontaneous and purposeful, directed radiation. Another factor which increases the effectiveness of radiation is joy. This may cause surprise at first, but we can easily become convinced of it by realising that joy has always a stimulating and vivifying effect, so that it facilitates and enhances the effectiveness of every action. 2. After this preparation comes the exact formulation or visualisation of the idea. It can be a word or a phrase and, whenever possible, an image or a picture. (a) By visualising the person, nation, world, etc. (b) By sending a wave of love in the same direction. Love is a great linking and unifying energy. 4. In the fourth stage comes the actual projection. This is best done by visualising a channel or beam of light projected towards the target; or, in the case of a general radiation, beams of light in all directions. A real danger arises when, prompted by our will-to-power, we are tempted to impose our radiatory influence on others. Even if we do this with the best motives, it may be harmful. Let us remember that we never have the right to infringe the freedom of others, and we must beware not to project on others our “ideal” image of them, or what we think they should be. This very common mistake is often made by parents. It is committed either by an outward display of authority, or by means of “persuasion” and suggestion, but it can be just as harmful in a subtle way if it is done through radiation. Therefore, let us realise our responsibility in this respect and never try to influence in any specific direction. The same warning may be given concerning” prayers” or projected thoughts used for influencing political or religious leaders in specific directions Radiation may also be too intense, and this may have two effects: it may repel the recipient, evoking a contrary reaction, or it may “burn” and be destructive. The effects of the sun’s rays provide a good example. The Sun is the source of all life and its rays are beneficent, healing and life-giving; but when they are too intense, we retreat into the shade, or, if we persist in remaining exposed to them, we may get sunburnt and even suffer sunstroke But that is not the fault of the sun, but of our own stupidity. A blessing or benediction might be regarded as “a transfer of spiritual energy.” This illuminates the concept of radiation. When someone with spiritual power blesses another, and the blessing is not formal or perfunctory, it is a transmission of energy, a form of radiation. Blessing and healing are also linked and a real blessing can have a healing effect. This is not necessarily physical, but can be psychologically and spiritually beneficial. Also in healing, however, there is need for caution. For instance, concentrating the attention on the patient’s illness, or on the parts of the body affected, might have undesirable effects. Under the Law of Cause and Effect the release of divine energies emerges as radiation, and the redemptive process of evolution is thus carried out. So blessing becomes part of the redemptive process of evolution. Each of us can and should be a “centre of radiation,” affecting other centres and lives and in this way fulfilling our part in the redemption of the planet. We each have our sphere of radiation; it is our area of responsibility, and within that sphere-which is larger than we think-we can serve in an effective way the Purpose of Divinity. 1. To avoid congestion and overstimulation in ourselves. 2. Because they are most valuable, and it is our duty and privilege to utilise them for the benefit of mankind. It is possible to emanate or radiate these energies on spiritual, mental and emotional levels. The reality of such a radiation has always been acknowledged, except perhaps in the modern, materialistic cultural interlude from which we are beginning to emerge. Modern physical processes and technical achievements help us to realise both the possibility and the procedure of radiation. Two examples are the phenomena of spontaneous radioactivity, like that of radium, and of induced radioactivity through bombardment of atoms in cyclotrons. Radio and television also demonstrate the possibility of transmitting sound and images on the ether without any material means in the sense of visible matter. If these things are possible on etheric levels and with etheric energies, it is not surprising that they occur on more subtle levels, in the psychological and spiritual worlds or realms. Here we find the phenomena of spontaneous telepathy which so frequently occurs, and also the experimental telepathy which has been scientifically studied in recent years and its validity sufficiently ascertained for few to have reason to doubt it. An important fact that should be realised is that the Soul or Self is endeavouring to infuse the personality all the time. We do not have to “storm” the Soul; it is ever reaching out towards the personality. This infusion can be considered the blessing of the personality by the Soul. Meditation is obviously the great means of transmitting the radiation or blessing of the soul and the spiritual realms. Various forms of blessing are given on the following pages, and these suggest the many different directions in which blessing may be sent. In meditation the aim is to pass quickly through the stages of concentration (using the will), through rapid alignment of the quieted physical, emotional and lower mind, to soul levels; this can be visualised as an upward moving to the Soul. Then we should remain poised in a receptive attitude. We should not look for conscious results, but do the work daily with confidence. Sensitivity to the Soul has to be cultivated; so many earthly energies clamour for attention that we are not aware of the energy of the Soul but if we persist, just “keep on keeping on,” Soul infusion will be attained. Every technique has to be consistently practised to attain efficiency. Witness our great musicians, artists, scientists, athletes and all who attain success on the material level. Every potent blessing requires the use of the will. It first use is to eliminate obstacles; this can be expressed as “making room” in time and consciousness. “Making room in time” means consecrating regularly a certain span of time to blessing meditation, protecting it from all the “pulls” and claims which try to induce us to outer activity. “Making room in consciousness” means pushing out of the field of consciousness all that normally occupies it or tries to invade it: sensations, emotions, images, thought, anticipations, memories, etc. Much will is needed for concentrating on active blessing, avoiding a negative, dreamy condition. Above all, let us seek an enlightened fusion of our individual will with the divine Will, and this for the greater good of the Whole-for all humanity. This blessing is based, first of all, on recognition of the gifts of the lower kingdoms to us and is an expression of the gratitude we owe to them. In a wider sense, from a universal point of view, it is prompted by the realisation that they are all part of Divine manifestation, that they are unconsciously proceeding on the way of evolution, and that the function of humanity is to help them on that way, and finally to redeem them. An effective means towards this is blessing. Our closest relationship with the other kingdoms of nature is- that created by our using them as food. In this way they give us a needed service for which we should be grateful. On our part we transmute them by incorporating them into ourselves. This is the basis (even if unrecognised) of the old custom or ritual of blessing food and saying grace. At present food is generally taken in a hurried, absent-minded way, but eating and drinking with gratitude and appreciation would bring added benefit to us. and the fruit of the labour of many beings. We are grateful for it and bless it. This blessing has a special significance, purpose and usefulness owing to the peculiar nature of its object. Money can be regarded as materialised or condensed Divine energy. In its essence it is therefore something good and pure. But in the course of its use money becomes polluted by the evil passions, the low desires, the worries and fears, the selfish attachment of all to whom it temporarily belongs. This is not merely a symbolical or psychological connection. Evil forces become attached to money and, possessions. This is one of the chief causes of the trouble individual and collective strife, and maladjustment an unjust distribution connected with material goods, and particularly with money. If this cause has a subjective character, the true solution, the effective remedy, should be of the same kind: primarily subjective, psychological; and spiritual. In fact, the right use of money depends on right motivation, which is a subjective, psychological urge, determining right choices. But there is a more specific way of counteracting what can be considered the “curse” attached to money (This “curse” forms the central theme and the deep meaning of Wagner’s series of musical dramas, “The Ring of the Nibelung.”) The spiritual purification and redemption of money can be achieved by the conscious use of our spiritual and psychological energies. It can be accomplished by the use of concentrated though animated by right feeling (or emotional force) an projected by will, through the use of affirmation formulated in words. If we subjected all money which passes through our hands to such a “treatment,” and if an increasingly large number of people deliberately did so, many problems which find no external and technical solution would be done away with. This may seem surprising, so little are we accustomed in this materialistic civilisation to give true practical consideration to the reality and the power of subjective forces. Yet it is so, and if we are consistent in our spiritual convictions, we cannot but admit it. From every attachment and craving. I will use it only for good, right, appropriate purposes. In using it, again I bless it and give thanks for it. This blessing can be extended to all material possessions and objects. A blessing can also be addressed to those who give money or other possessions for spiritual purposes and uses; this may also include future, unknown “givers”. This might seem to be the most difficult kind of blessing. Our first natural reaction to obstacles is generally one of rebellion or resentment. According to psychological type, it manifests as irritation or self-pity. Yet there are good reasons, first for graciously accepting obstacles, and then for blessing them. It has been said that the purpose of obstacles is to draw upon the latent will. “Blessed be the obstacles, they teach us unity and resistance” we read in the book Heart (Agni Yoga Series). The positive function of obstacles is often unconsciously recognised, particularly by the young; they resent the easy life and look for adventure and risk, with their accompanying hardships. In a more general way we might say that in sport and games people create obstacles for the satisfaction of overcoming them. Moreover, the willing acceptance of obstacles and the recognition of their usefulness helps to overcome or destroy them, sometimes in a surprising way. with whom I am, or shall come in contact today, be blessed – now and forever. 1. The body sits relaxed. 2. The emotions are stilled, so that they do not interfere (” quiet as a mountain lake “). 3. Then we observe the “monkey” mind (as it has been called because it jumps around). This, too, must be quieted and, if it leaps away, be brought back to stillness, to face the Soul. So aligned, we raise our centre of consciousness towards the Soul and endeavour to enter into communion through a chosen seed-thought or consideration of a spiritual quality, such as goodwill, joy, peace, or the realisation of world need. “Breathe out” the ideas as formulated thoughtforms into the great stream of mental substance which is ever playing upon the human consciousness. I stand within the Light, and as the Light shines through my form, I radiate that Light. (a) Your immediate circle of family and friends. (b) All those with whom you come in contact. (c) Those in places of responsibility all over the world. (d) Humanity as a whole. See this beneficent light and blessing streaming forth as you hold your hands, palms outwards, in blessing. The hands can play a most potent part in transmitting “spiritual energy, and one that is little understood. The “laying on of hands” is no idle phrase, nor is it confined solely to the operations of the episcopate of any faith. Gestures help to concentrate the mind, focus the attention and direct currents of energy. Physical movements help to give a sense of reality; but their value is chiefly symbolic and when it is not possible to make the movements, they can be performed in imagination, that is, visualised. They are effective in this way, owing to the creative power of imagination. After the arms have been opened horizontally, they are folded in front of the chest, at heart level, and the hands are joined with the fingers interlaced. This gesture and position represents the phase of recollection and concentration. The consciousness, dispersed and distracted by a multitude of sensations, emotions and mental activities, is focussed into the centre where the personal “I,” ego or self, dwells (pure individual self-consciousness). 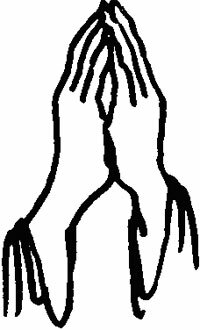 The second gesture is performed by extending the arms upwards with the hands joined as they are usually held while praying. It symbolises the raising of the personal centre of consciousness, propelled by aspiration, towards superconscious levels, the realm of Light, Joy, Love and Power, where the Spiritual Self, the Soul, ever dwells. There, as “living, loving, willing Souls,” we joyously realise our communion with other Souls (Group consciousness). “The Souls of men are one and I am one with them,” in the One Soul (Unanimity). The hands are opened with the wrists joined and the fingers forming a cup (the “Grail Cup”). In this position we invoke, with faith, joy and gratitude, the blessing descent of the divine energies (Light-Love-Power) and remain in an inner attitude of reverent, silent receptivity. The arms and hands are lowered and brought back to the starting position, with the fingers interlaced in front of the chest. This movement and attitude represent the conscious bringing down of the Light, Love and Power into the personality, which is thus being infused and pervaded by them. The arms are extended horizontally with palms outspread forward. In this position we perform the actual blessing, made powerful by the preparation and recharging of the preceding phases. We radiate the divine energies telepathically in all directions, towards all living beings. 1. LOVE TO ALL BEINGS North-South-East- West-Above-Below Love to all beings. 2. COMPASSION TO ALL BEINGS North-South-East- W est-Above-Below Compassion to all beings. North-South-East- West-Above-Below Joy to all beings. 4. SERENITY TO ALL BEINGS North-South-East- West-Above-Below Serenity to all beings.